Percy Casper is a Shushwap and Thompson (Interior Salish) Elder whose been beading since 1962. He does 3 styles of round beadwork - peyote stitch, brick stitch, and two drop. He also does 3 different styles of flat work - applique, Cree stitch, and lazy stitch. He beads ceremonial fans, dance regalia, and jewelry. 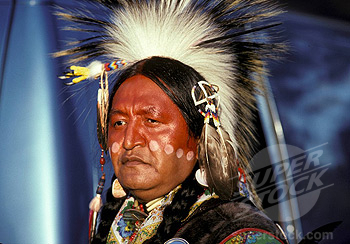 He's a Powow dancer and a Roadman. His whole life is surrounded by this form of artwork. He says that he'll "never reach his full potential, but will enjoy trying," and that "if his dna was done, they'd find beads, needles, and threads." Percy lives on his own land, and practices his culture. Click to view Percy's beadwork.